I just want to take a moment to tell you how amazing Leahey Gardens Mac and Cheese is. I purchased a bunch of these from Vegan Essentials, because I can’t find it locally. In my opinion, this is the best vegan mac and cheese in a box (or bag) on the market. It’s prepared very similar to the conventional kind in the blue box. The sauce is a powdered mix that you cook with some water or non-dairy milk (I also add some Earth Balance to it) then mix it in with the cooked noodles. So simple and so delicious. 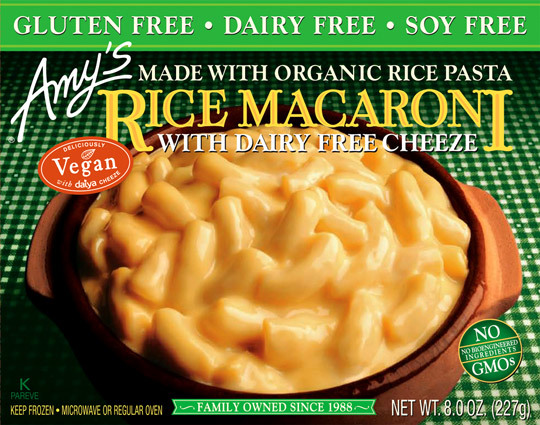 And also a shout out to the best frozen mac and cheese out there: Amy’s Rice Macaroni and Dairy Free Cheeze. Even easier than Leahey Gardens! Just pop this guy into the microwave. It’s a small meal, but very satisfying. And the best part is that this one is pretty readily available in your local grocer’s freezer section and is gluten free. But if you don’t want to clean up dishes from either of these, I’d like to tell you about a Vegan Mac and Cheese Competition coming up this Saturday, October 13th in Los Angeles. Pay $5 to sample vegan mac and cheeses from local restaurants. There will be a People’s Choice Award and a Judge’s Choice Award. Get there early, because (apparently) only the first 100 will get samples. See details here.